Refurbishment of the Bedford Girls School science block has been completed. Working against a tight schedule, our team, alongside others, worked quickly and efficiently to provide a high-quality finish for the project. We have previously done multiple builds for this client and have ensured the highest standard of finish each time. This being our 5th scheme for the client, we have worked alongside other companies who helped along the way in completing this state-of-the-art build. 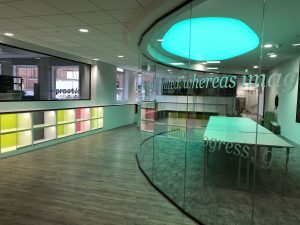 Having previously worked with Goodrich Consulting and TMW Architects on projects for the school, we were able to work alongside one another to provide a successful result that the client was pleased with. The school required a refurbishment of an already existing science department. Including: 6 of the laboratories, 1 prep room, a locker area, chemical store and a staff room. Using this basis, we created a multifunctional and flexible environment featuring a 9 screen LCD TV wall, a coloured LED light feature and height adjustable tables. Following the School’s colour theme, we employed pink, green and grey as is shown in the LED display. 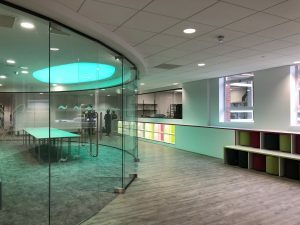 Within this space is a curved glass wall, creating a teaching space that the students and teachers can make full use of with lights, pictures and sounds. 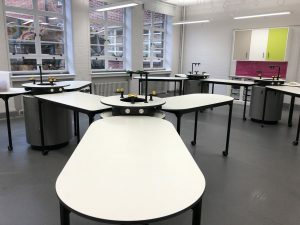 The final result, a modern, state-of-the-art science department, we hope will create a more engaging and interesting learning environment for both the staff and students to enjoy and we look forward to working more with Bedford Girls school in the near future.